Hi everyone! Here is a video for those who are new to the world of baking & cake decorating. I will teach you how to successfully mix & bake a cake, how to freeze, trim, & settle your cake layers, and how to crumb coat & pipe a simple ruffled design. We will go over all of the key baking and cake decorating tips and tricks that will help you to become a better baker and cake decorator! These cake decorating methods are tried and true, and as you will see, they are not difficult to do! Have fun experimenting! Part One of our tutorial covers mixing, baking, and freezing your layers. Part Two of our tutorial covers trimming, leveling, settling, and decorating! *Please find our additional notes, RECIPE, and materials beneath the video. Enjoy! After removing the cake layers from the oven, place pans on elevated rack for about 10-15 minutes before flipping cake layers onto the cake boards. Wrap and freeze the cake layers while they are still warm–this will give you an extra moist cake. Thaw frozen cake layers while still wrapped until partially frozen. Level & Trim sides as needed with a serrated knife. Wrap unfrosted tier with plastic wrap & apply a weight to the top. Settle the tier for at least three hours or overnight. Trim cake board down to size as needed. Crumb coat. Apply final coat of frosting or fondant. 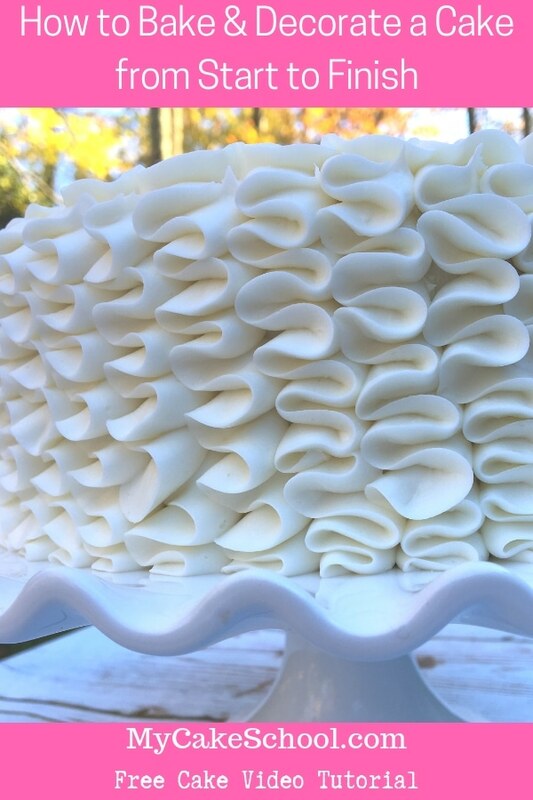 ** If your smoothing method (Viva paper towel method for instance) requires a crusting buttercream, WAIT until cake is room temperature before applying the final coat of frosting. When crusting buttercream is applied to a cold cake, it takes forever to crust. The Reverse Creaming method (also known as the hi-ratio or two stage mixing method) is used in our recipes from time to time. The ingredients are the same, but are added in a different order. With this method, the dry ingredients and the sugar are mixed first. Then the fats and a portion of the liquids are combined with the dry ingredients, followed by the remaining liquids. The result is a velvety cake with a finer crumb. **The Reverse Creaming method is meant for recipes that have a greater amount of sugar than flour (by weight). Great video. Thank you. I have a silly question. After filling and settling the cake if you have a bulge, do you cut away the excess frosting and proceed with the crumb coat? This video is such a nice one to add to your library of techniques. Alady, Carolyn Duvall Lawrence, who has done cake decorating for years, shared a great tip with me. Instead of taking the cake layers out of the pan to wrap, she just leaves them right in the pan and wraps in layers of saran wrap. I have found this to be a real time saver. I don’t have to worry about misshapen layers because the pan protects them until they are completely frozen. When they have come out of the freezer, I can just trim the top portion of the cake level with the pan. The only down side to this method, is that you need multiple pans. Great tutorial. Thanks for the tips. My last cake turned out like a wet sponge. Now I know why! @Queridam- Yes, if you notice anything that needs to be smoothed or trimmed away after the settling process, you’ll want to take care of it before crumb coating and frosting the cake. Never say you can’t teach a old dog new tricks. I’ve been baking for years, and although most of this is familiar, I learned a couple of handy tips I never knew before. Definitely going to use on my next cake. I should mention my cakes don’t dome as I use flower nails in my pans and place my pan on a pizza stone. Seems to distribute the heat preventing the dome. I also saw a tip on letting your batter “rest” in the pan on the counter for up to 20-30 minutes before popping into the oven. Although sceptical, I tried it…and it worked!! Thanks Melissa for a great video..concise and informative. A question Melissa. Forgot to ask in my last post. I noticed you didn’t dowel your cake with either bubble straws or wooden cake dowels. I always dowel my cakes, especially if I’m transporting them. Hi June- thanks for your comments! – We should have mentioned that we like to use rose nails too for cakes that are 10″ and up to help distribute the heat. Interesting tip to place the pan on a pizza stone & also letting the batter rest. We usually don’t have much of a dome with our scratch cakes anyway, but for the doctored mixes, I’ll have to give that a try sometime! Great videos! So helpful to see the whole process. I have a question on the logistics of the oven positioning. When baking two cake pans at the same time, is it necessary to rotate the pans mid way through baking? Also, what is the best placement of the pans and are two cake pans the maximum number of pans you would suggest to bake at once? Hi Samira, When I am baking two cake pans I don’t rotate the pans. I can bake three 8 inch round on the top rack of my oven. With some recipes all three are done at once, but sometimes I need to take out the back two pans and bake the front one a bit longer. I don’t rotate those either. The rule of thumb is to have air space between each pan and the pans should not touch the sides of the oven. If you happen to have a convection oven you would be able to bake on both racks. Love the video and all the tips. I just have a question about the recipe for the White Almond Sour Cream Cake that was posted with the video. Is there any almond flavoring added to the cake? I didn’t see any almond flavoring listed with the recipe. Loved this and learned many new points I’ll put into practice!! Thanks for making your post, Janis ! I am having a real problem with my cakes sinking in the middle. I researched this and found that opening the oven door can cause this and over mixing can do this so I make sure that I don’t do either. I am baking the WASC into 8″ and 6″ pans at 350. I am not doing the reverse creaming method. I would really appreciate any help. I don’t know how to fix this. It also happens with the chocolate recipe. ??? Hi Terri, Well, I am sure this is so frustrating for you! Have you checked your oven temperature? I think you might need to buy an oven thermometer to see if you oven is actually heating to the temperature you have set. Let us know how it goes. Hi Bebe, thanks for your response. I do have an oven thermometer and my temp is 350. I baked 2 8″ and 2 6″ cakes. All 4 sank in the middle. It happens most of the time. My cakes never done. The cake mixes aren’t expired. Do you think I should just use flower nails? Bake at a lower temp? The cakes look fine till they are almost ready to come out then they sink. Errrrr! I end up with half to 2/3s of a pan once I level. Hi Terri, OK, that is good, it is not the oven temperature. I thought your cakes were sinking after being taken from the oven. Sinking while still baking and almost done is not as typical a problem. I did some research and the most common reason for the cake to sink in the center during baking is too much flour. You are baking the WASC using a cake mix, right? When I measure the flour I lightly spoon the flour into the cup then level it off using the back of a knife. If you dip the measuring cup into the flour container and scoop out the flour you will be packing more flour into the cup than needed. Do you think that could be the issue? Another reason is not enough liquid to the amount of dry ingredients in the recipe but I thought since you are using a cake mix, this is probably not the cause. Let me know. Thanks a lot .I have learned a lot of new things and I will put it in practice. I have literally no room in my freezer Any other method i can use for a moist cake?